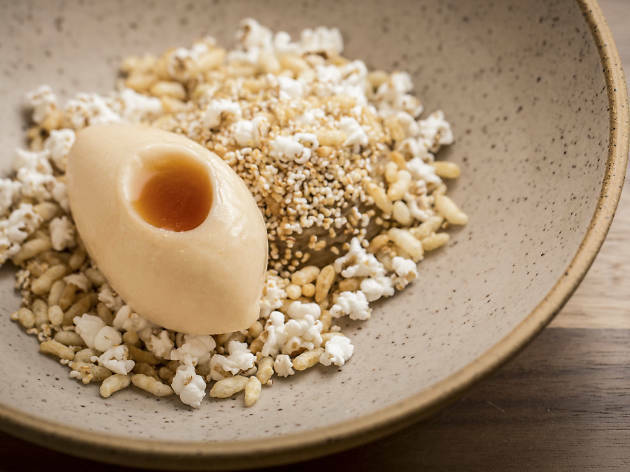 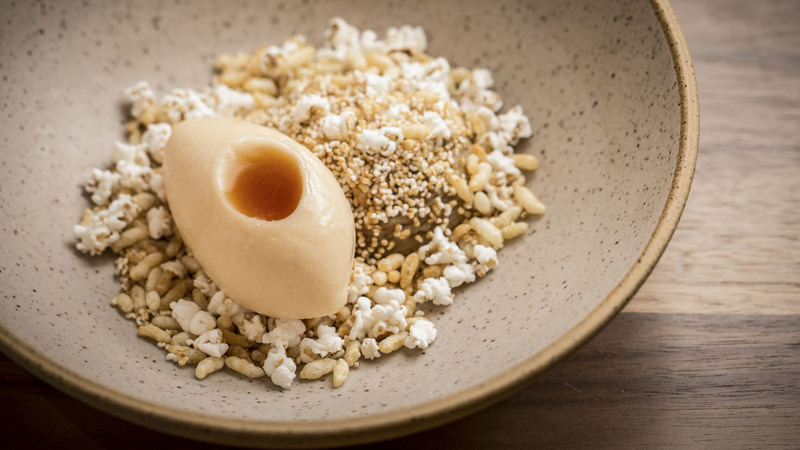 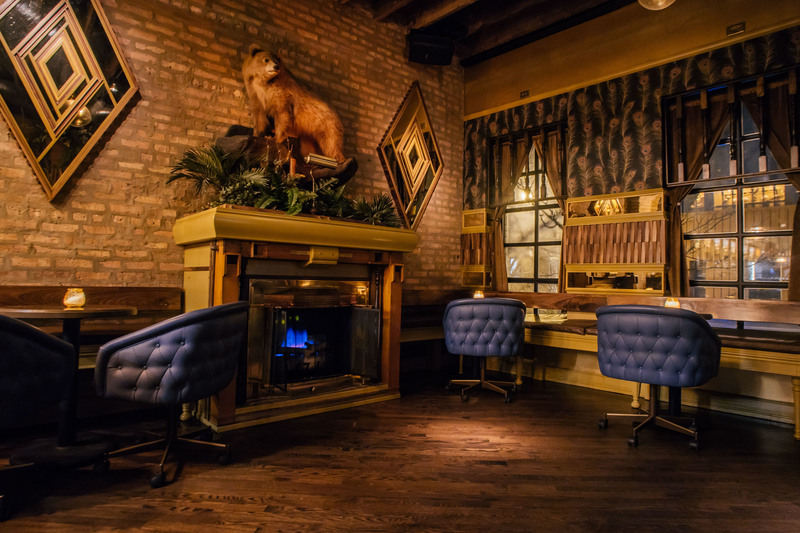 Chicago's long and brutal winters have one serious upside: Our favorite bars and restaurants turn into cozy hideouts, complete with Hot Toddies and hearty comfort food. 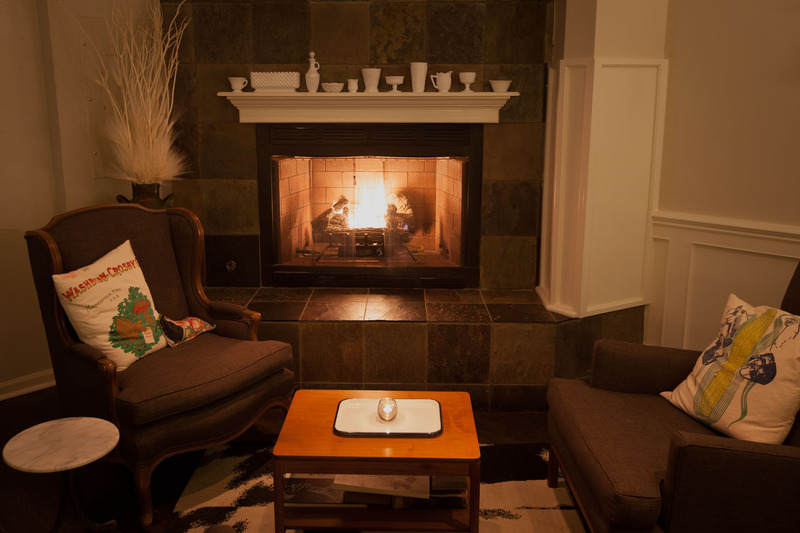 But the best of the bunch also have roaring fireplaces that make us feel right at home. 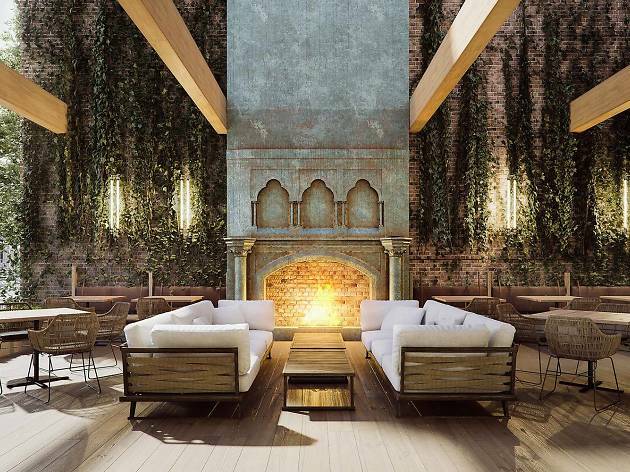 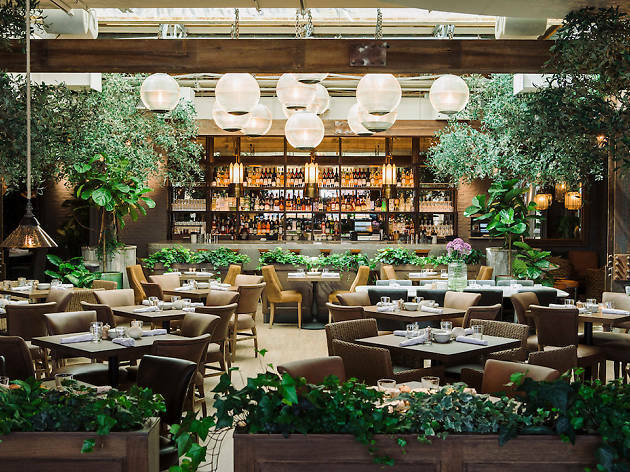 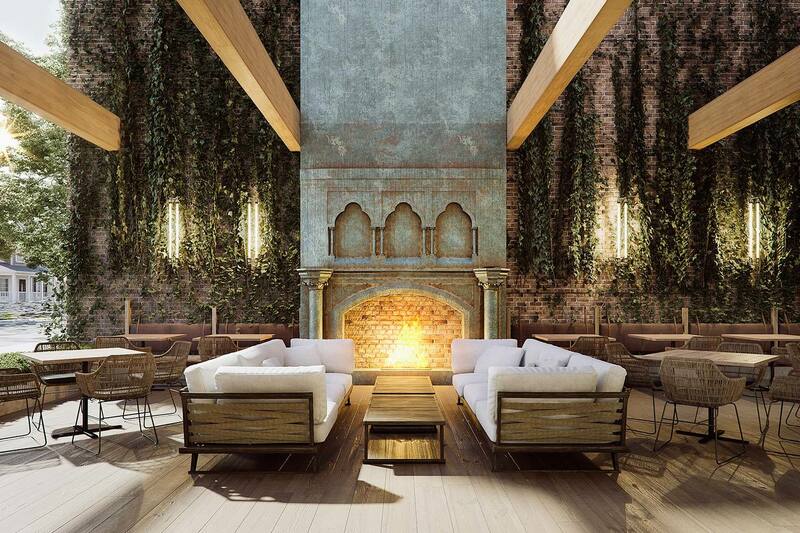 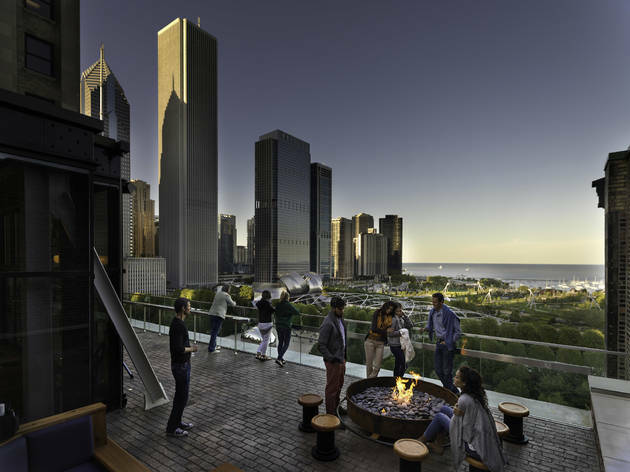 From four-season rooftop bars to Michelin-starred restaurants to famed Chicago dives, these bars and restaurants have the best fireplaces around town. 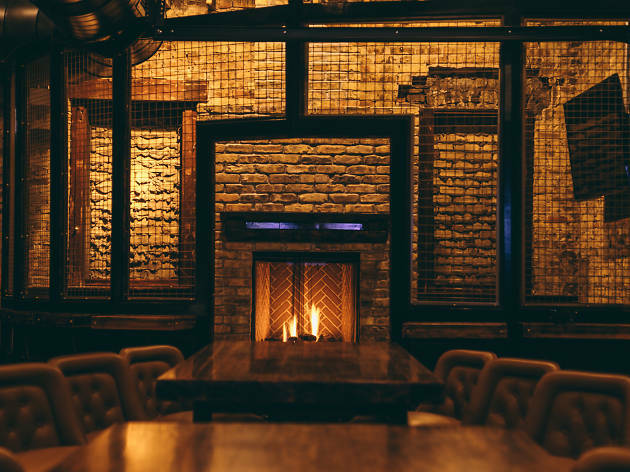 Grab a table, order a drink and curl up next to the 44 best fireplaces and fire pits in Chicago. 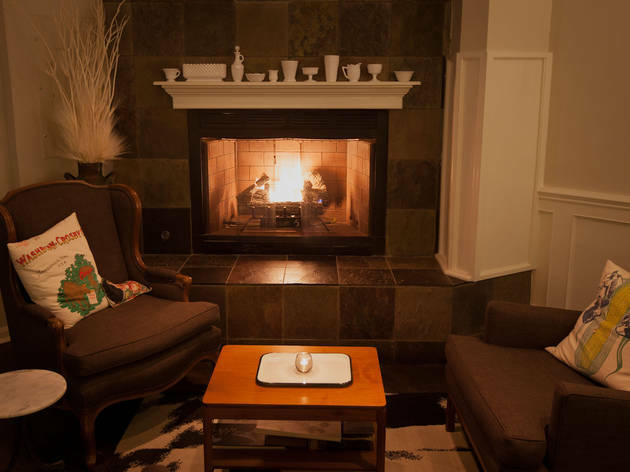 The Dawson boasts two roaring fireplaces: Cozy up outdoors by the massive stone mantle, or take it inside and snuggle next to the modern fireplace upstairs. 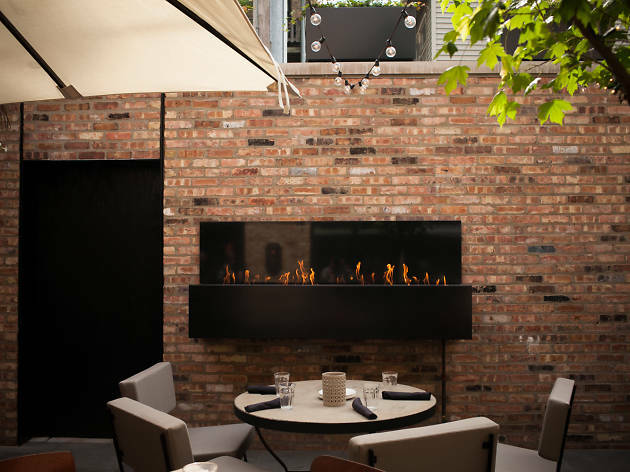 There's an impressive outdoor fireplace in the alcove just outside the entrance to David and Anna Posey's West Loop eatery. 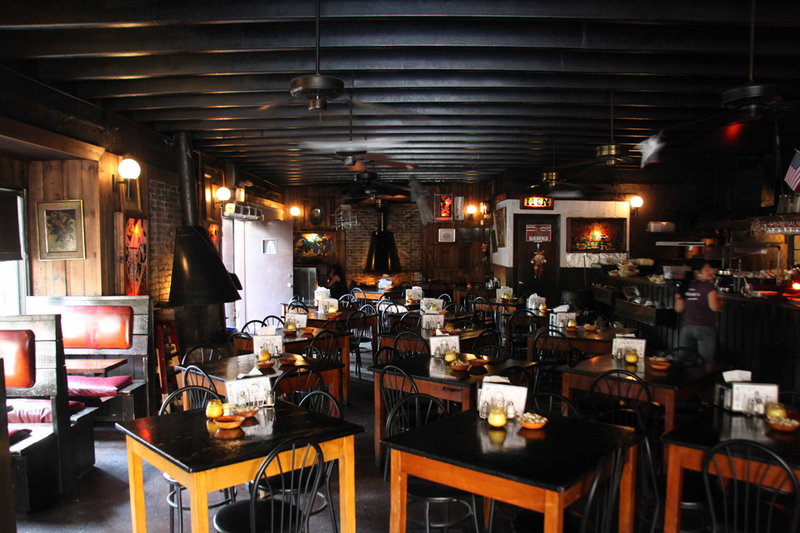 After the couple feeds you, take a breather next to the roaring flames. 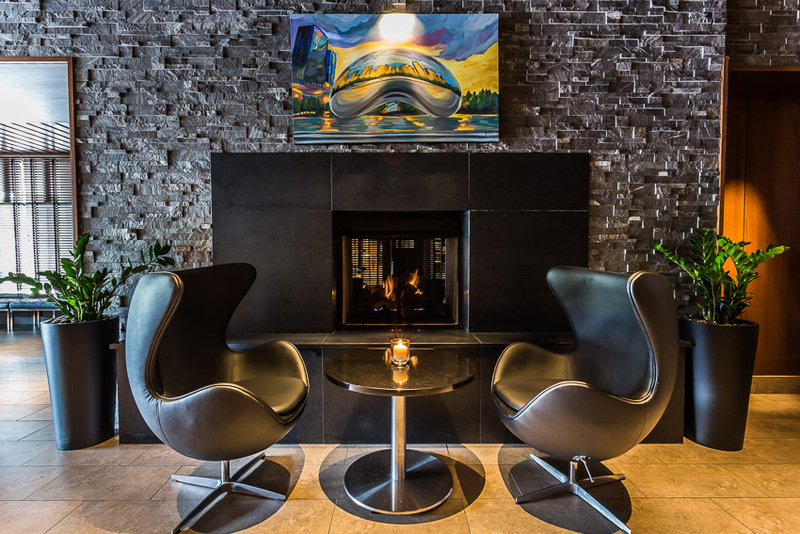 This Logan Square newcomer is outfitted with a partially enclosed indoor fireplace that feels like its own private space. 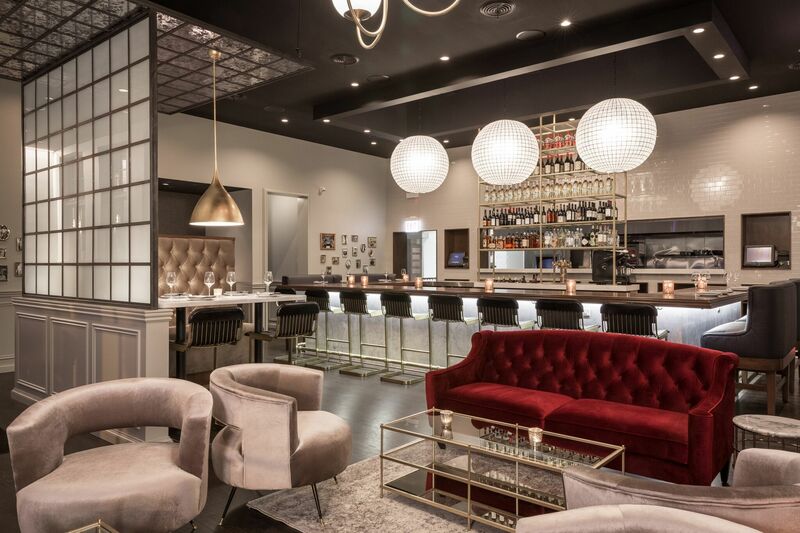 The first-come, first-served area makes an impressive backdrop for date night. 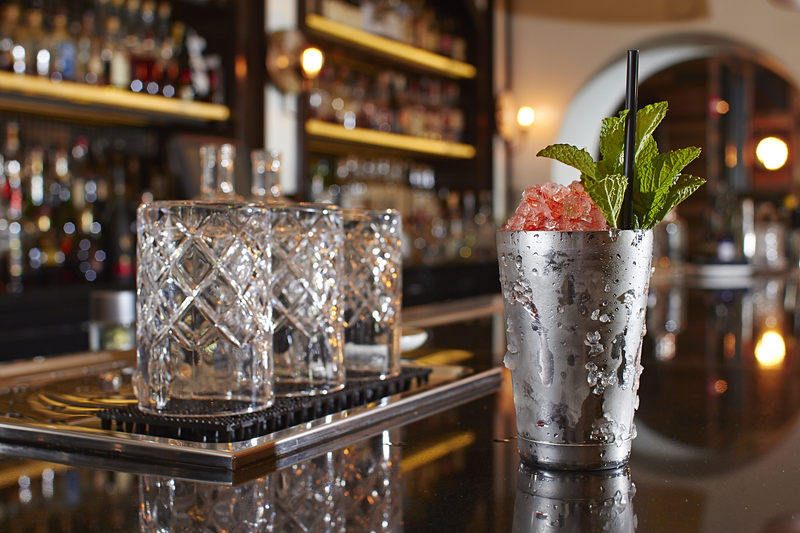 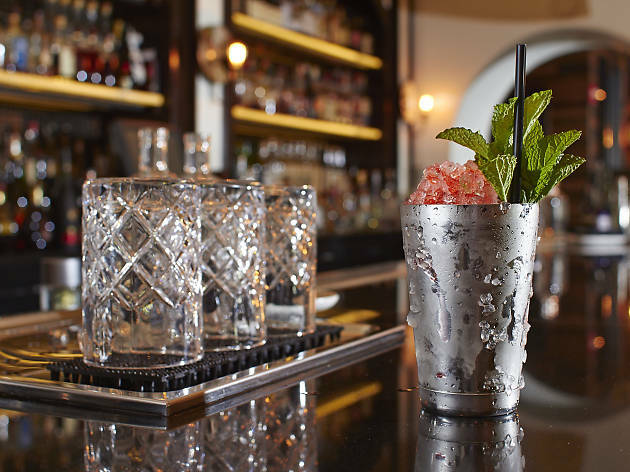 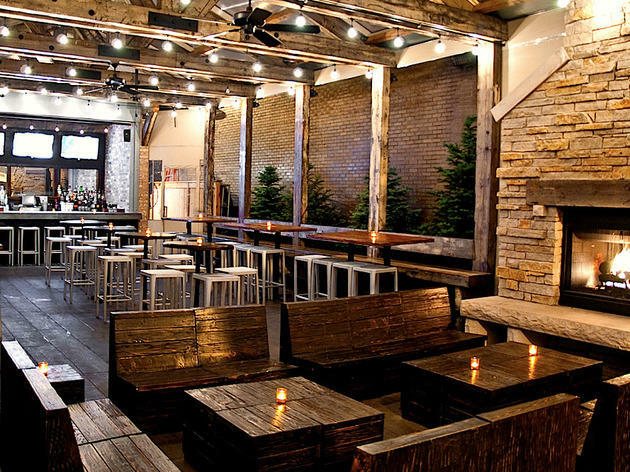 There are three reasons why Drumbar is pretty much exactly where you (and we) want to spend all winter: There's a fireplace inside, fire pits outside on the roof lounge and a long list of great cocktails. 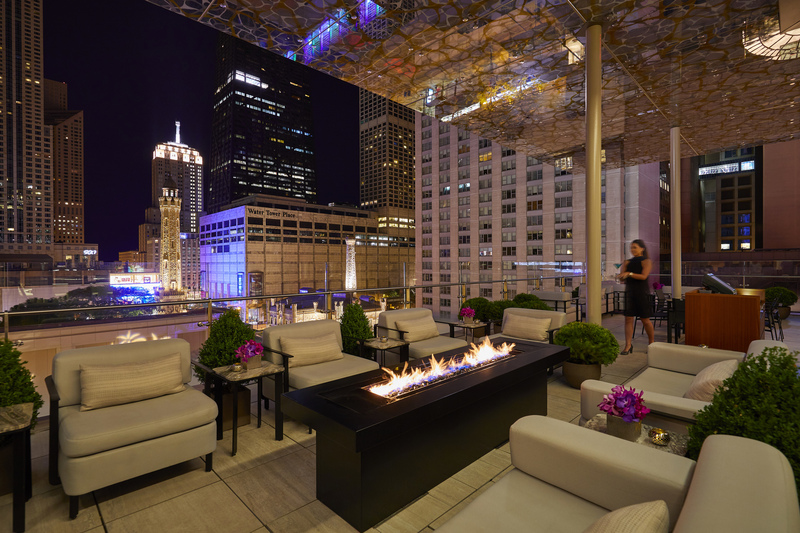 With firepits and flannel blankets to keep you warm, curl up with a glass of wine or a hot cocktail and enjoy one of the best views in the city. 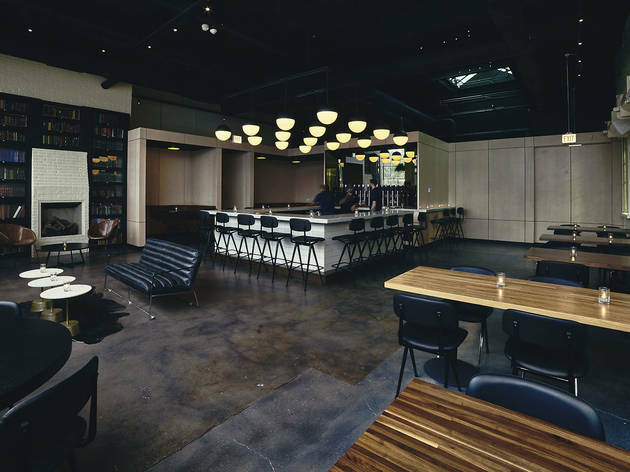 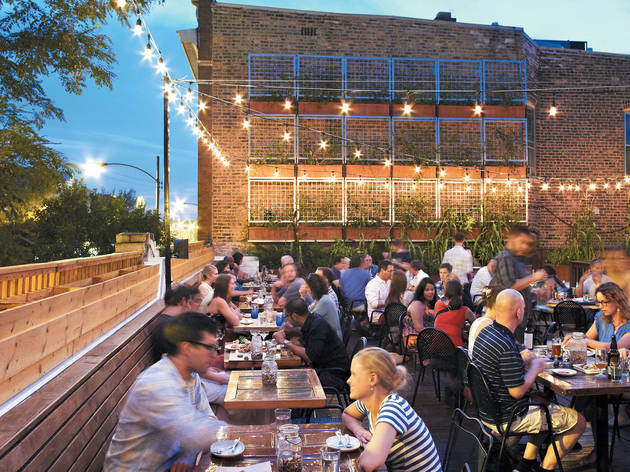 Though its kitchen and bar are housed in a former auto repair garage, Park & Field's main draw is its gigantic patio, which is dotted with fire pits. 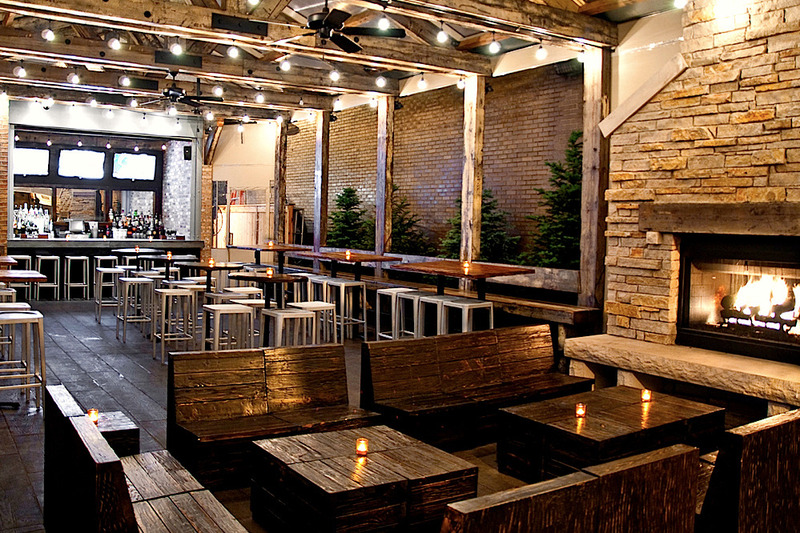 Secure a seat, order a basket of s'mores and tell winter to shove it. 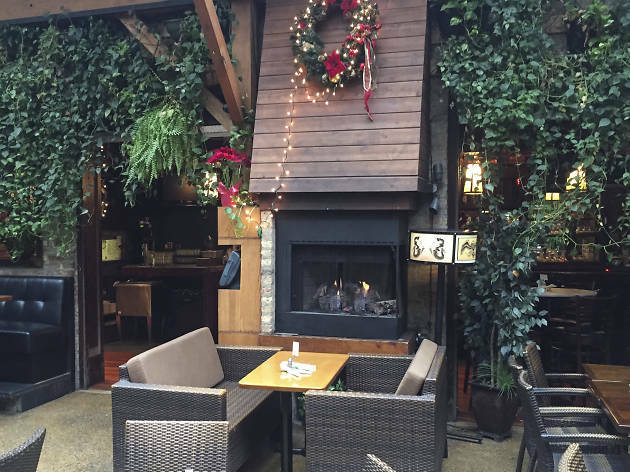 Sandwiched between Schubas Tavern and Tied House sits a grand outdoor fireplace. 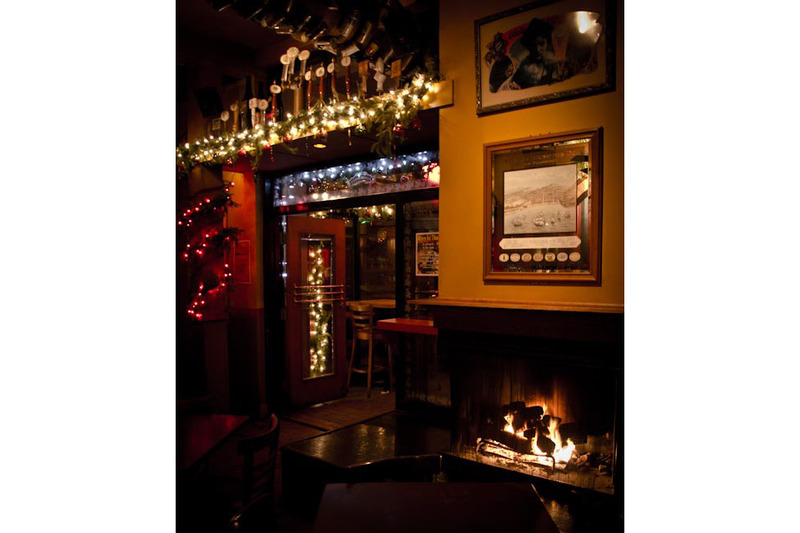 Grab a seat outside and warm your hands in front of the hearth, or enjoy the flames at a distance from a table inside. 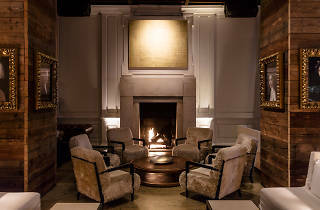 The flickering fire at Scofflaw is a lovely backdrop to the cocktail list (we're currently crazy about the Holy Collapse). 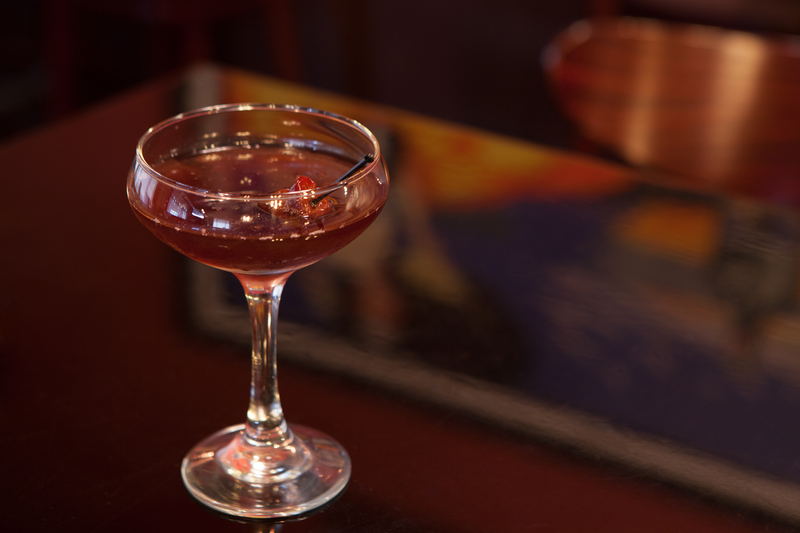 With dim lights and well-made cocktails, the Violet Hour is already a top choice for winter drinking. 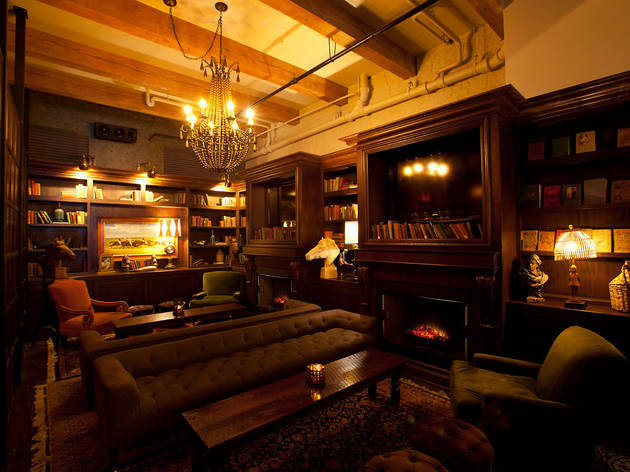 Add in a fireplace, and you've got one of the best winter bars in the city. 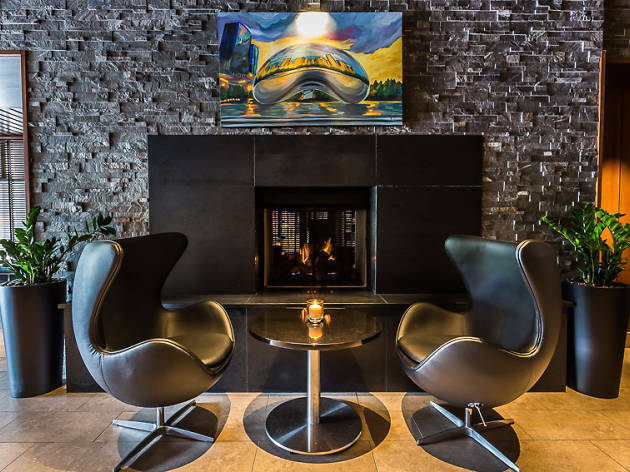 As soon as you walk into this stunning Lakeview restaurant, you're greeted by velvet furniture and a massive tile-lined fireplace—a fitting introduction to an exquisite experience. 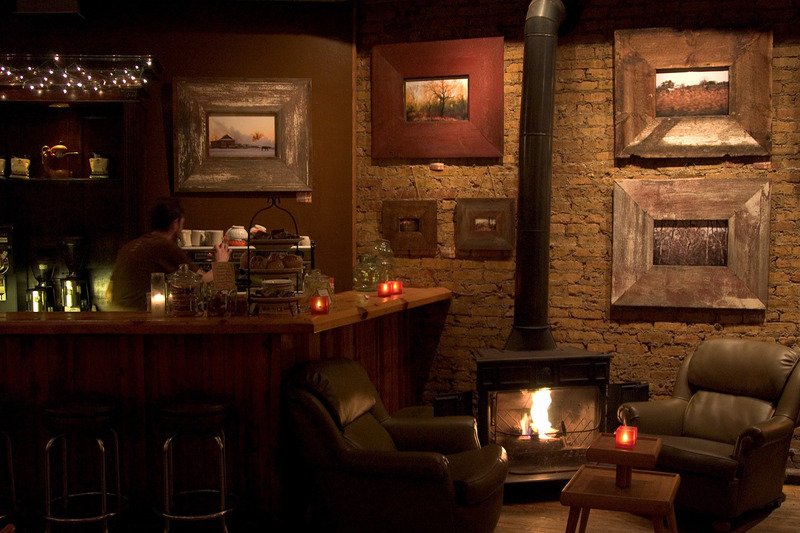 The daytime café transforms into a lounge by night. 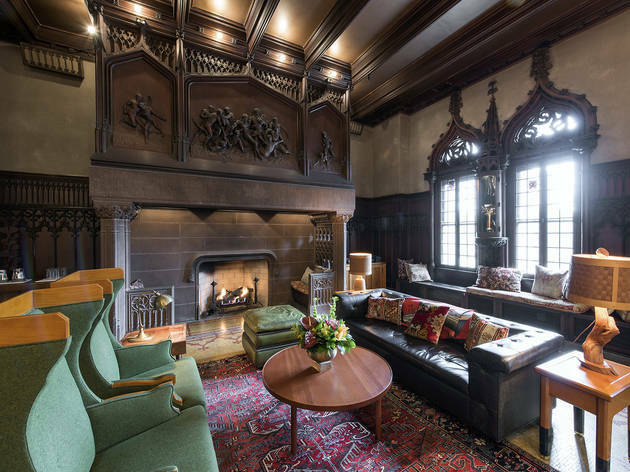 Grab an armchair upholstered in long-haired Mongolian lamb's wool (seriously) and cuddle up by the huge limestone fireplace. 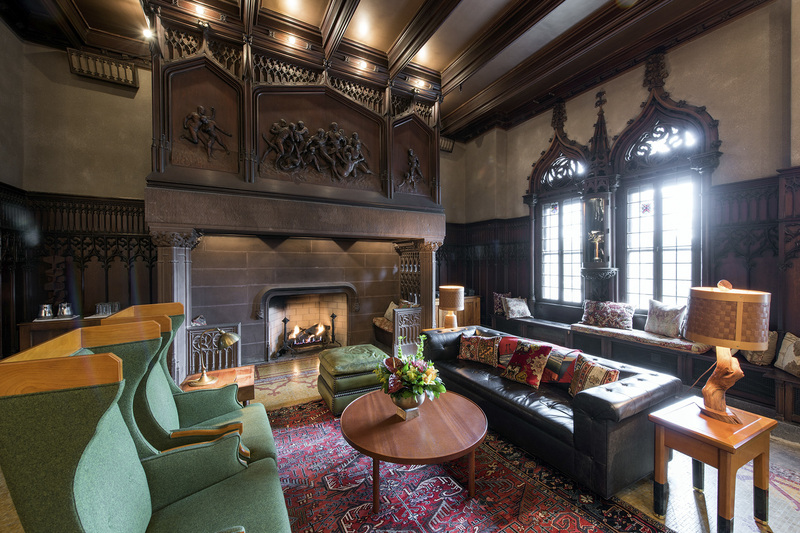 In the Drawing Room on the second floor of Chicago Athletic Association, three fireplaces add a warm feel to the library-like lobby. 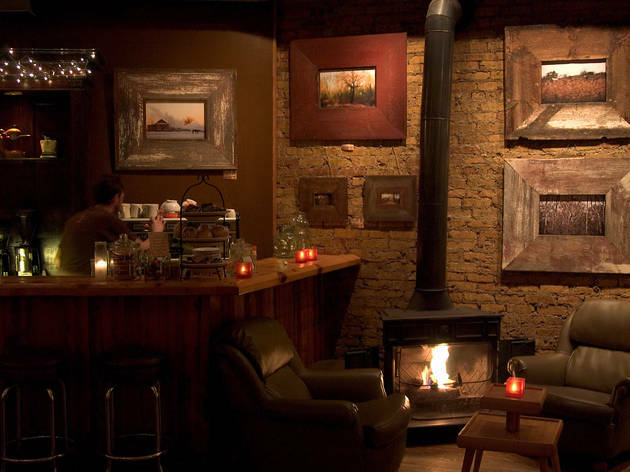 We're already heading to Allium for cocktails, and they're even better consumed next to the fire. 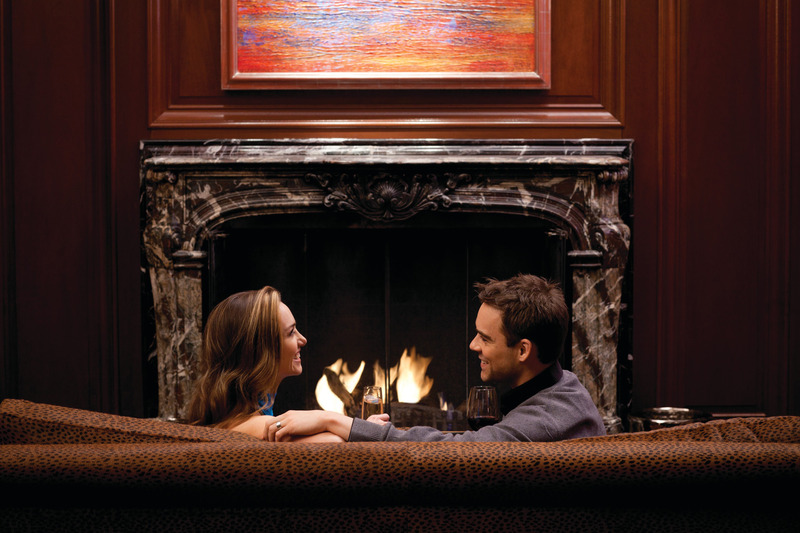 Tucked into the back corner of the Freehand Hotel lobby are two fireplaces ideal for warming up in winter. 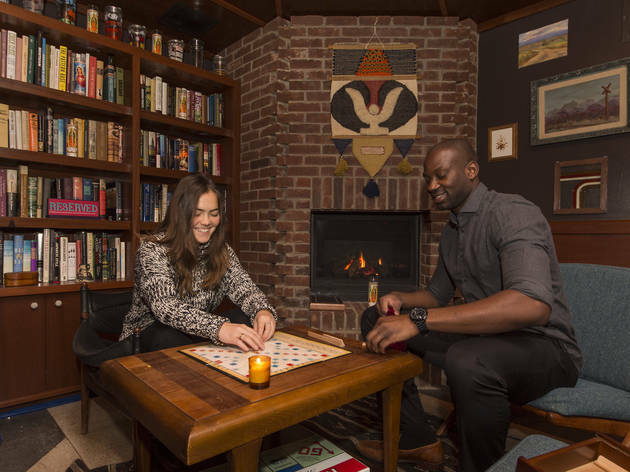 The funky lobby has a cabin vibe and dark lighting, plus board games like backgammon for whiling away cold nights over wintry cocktails. 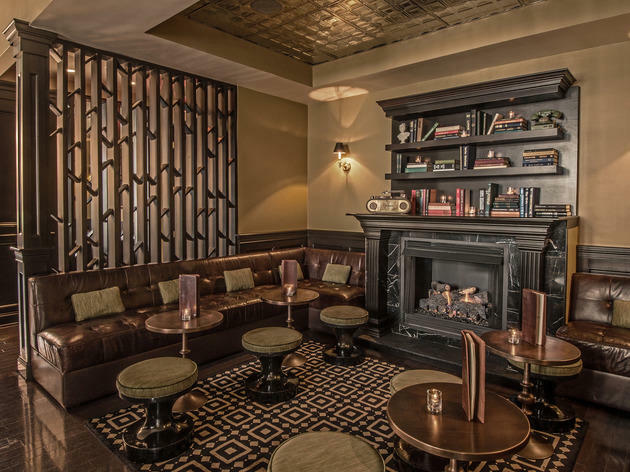 Big leather chairs and throwback cocktails make this place homey already, but grab a chair next to the fireplace for some extra comfort—especially when you've gotta take a break from all the dancing you've been doing downstairs at Slippery Slope. 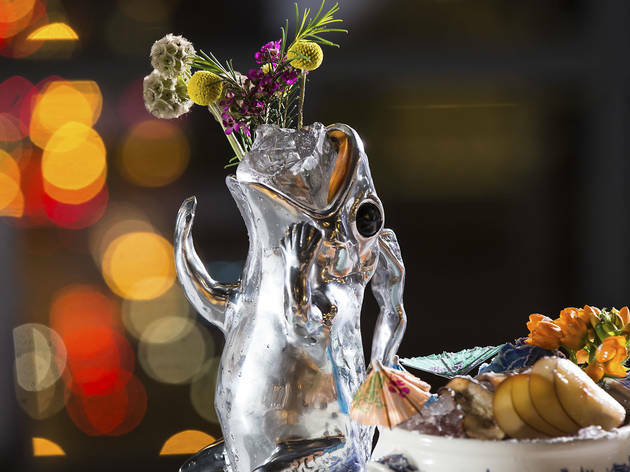 The Peninsula's stunning rooftop lounge has it all: sweeping city views, globally inspired cocktails, a roster of delicious, shareable snacks and two fireplace. 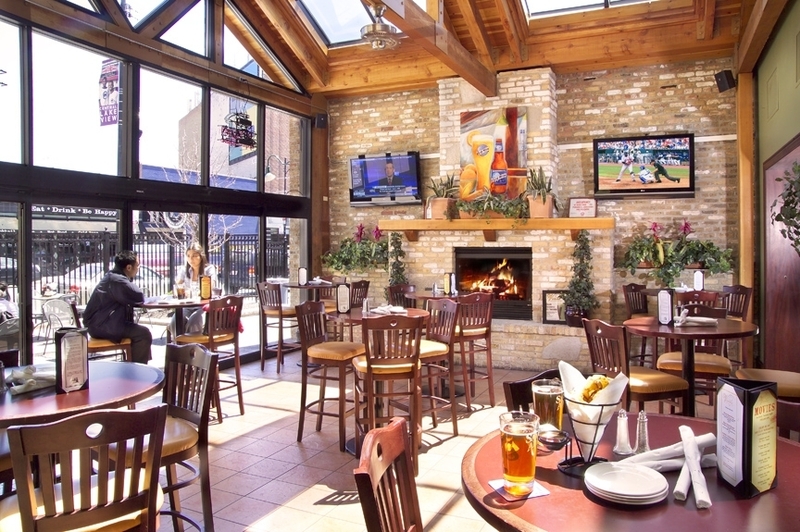 Frontier boasts several fireplaces, but we like the one in the beer garden. 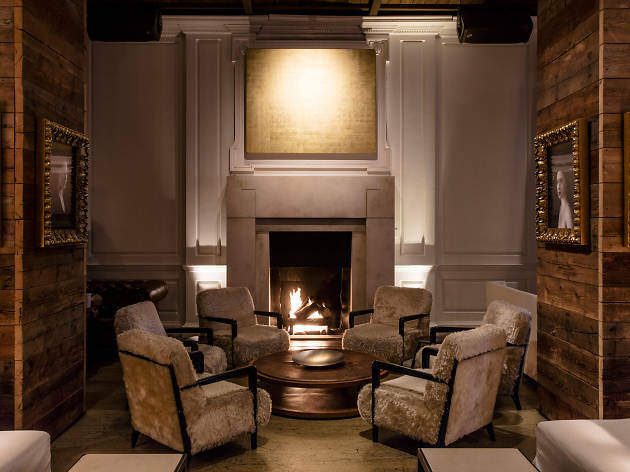 Order charbroiled oysters and sidle up with old and new pals to the large table in front of the stone fireplace. 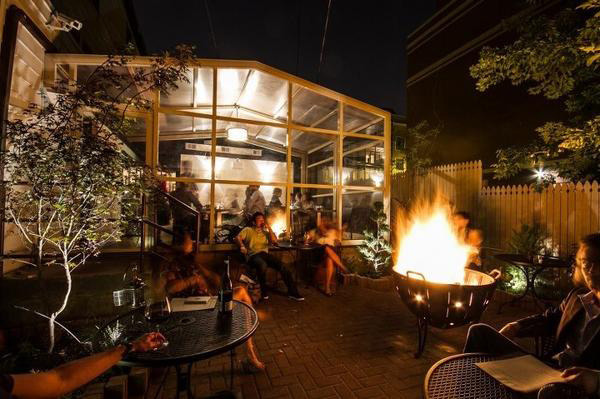 You're here for Benjamin Schiller's wildly inventive cocktails, but the trendy outdoor fire pits are a huge bonus. 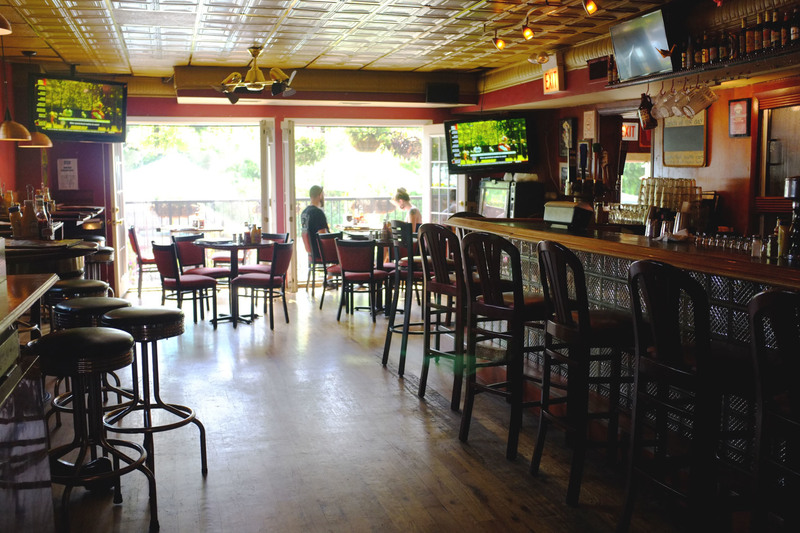 Ravenswood locals flock to this bar for its namesake’s warmth and coziness—and heavy pours of Scotch. 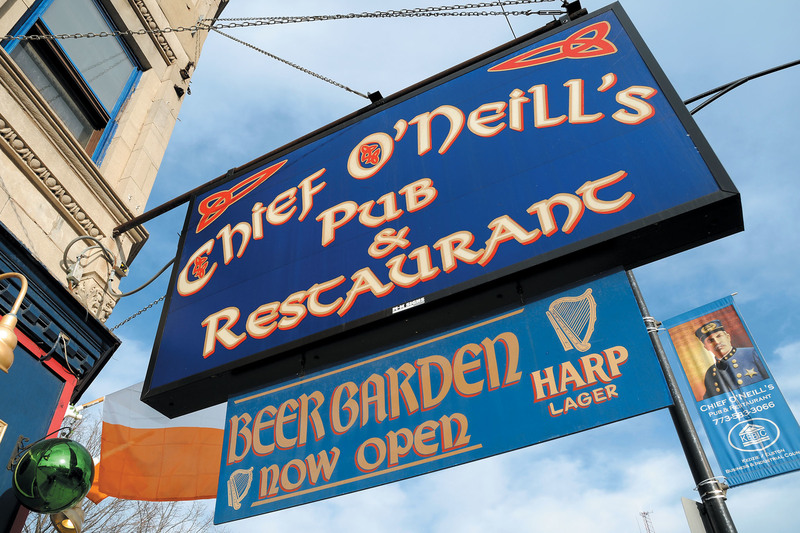 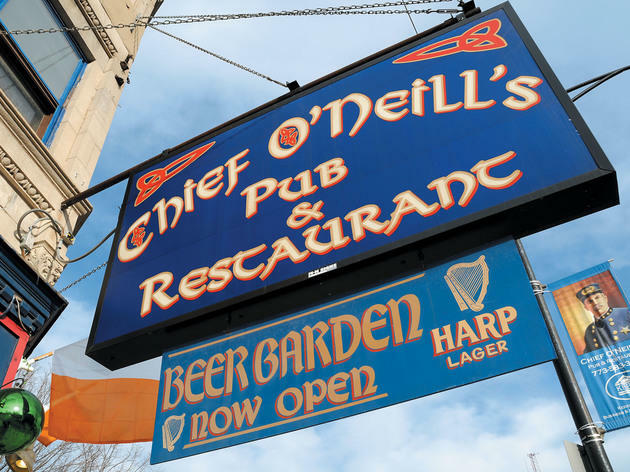 Chief O'Neill's has three fireplaces, live Irish music on Sundays and a long whiskey list. 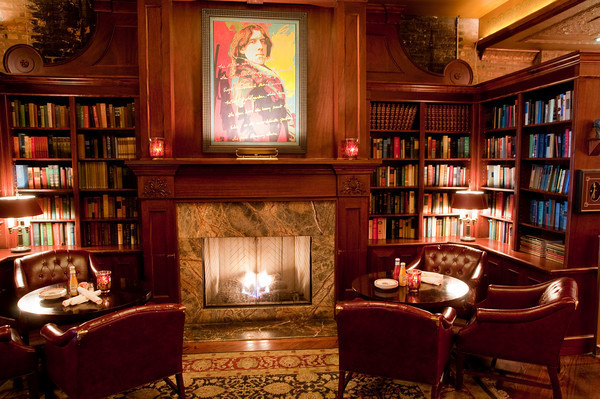 The fireplace at this well-appointed Pilsen brewery is surrounded by an impressive collection of brewer's books. 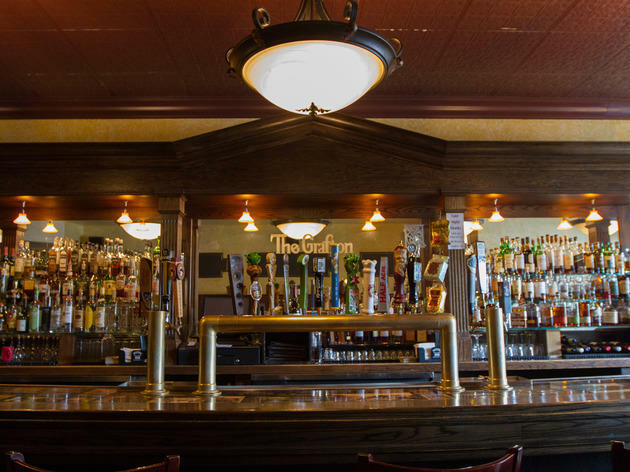 Extend your stay by ordering a slice of the 12-layer chocolate cake. 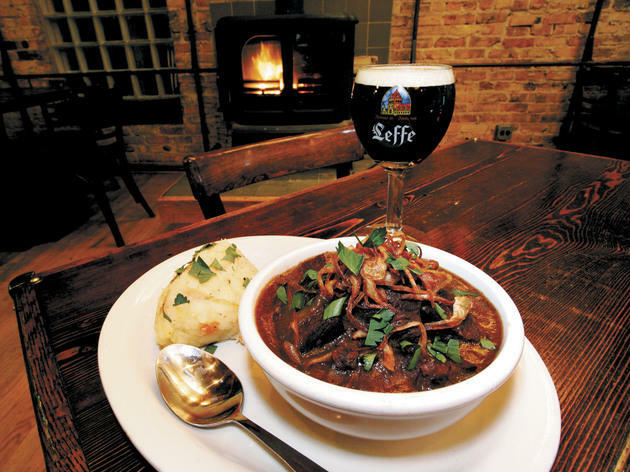 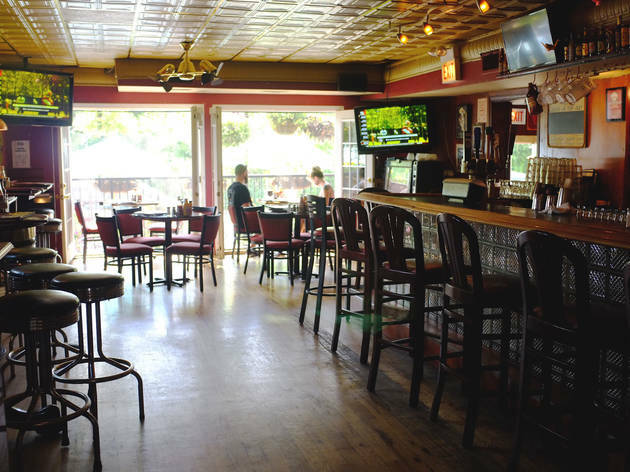 Grab a seat by the stone fireplace, then order a round of craft beers and Irish dishes. 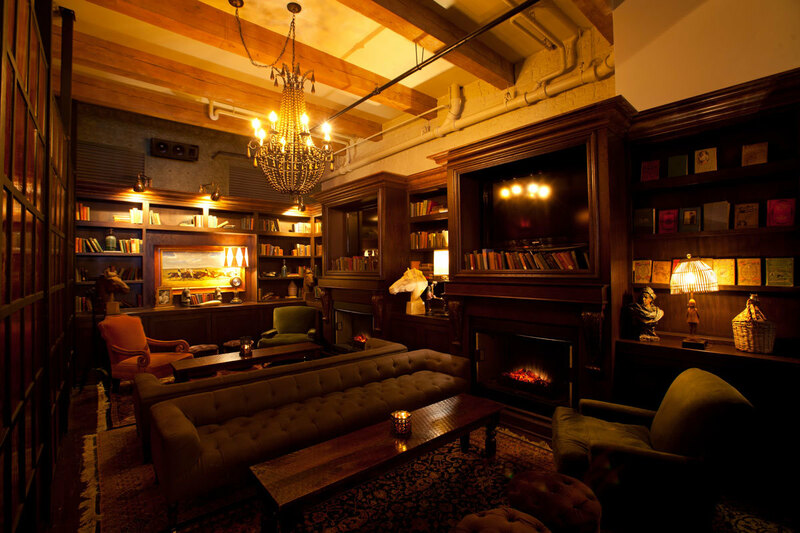 The Hemingway-inspired fireplace lounge has leather club chairs, velvet church pews and a chandelier. There are few better ways to spend a winter evening than drinking Belgian beers and eating mussels at Hopleaf. 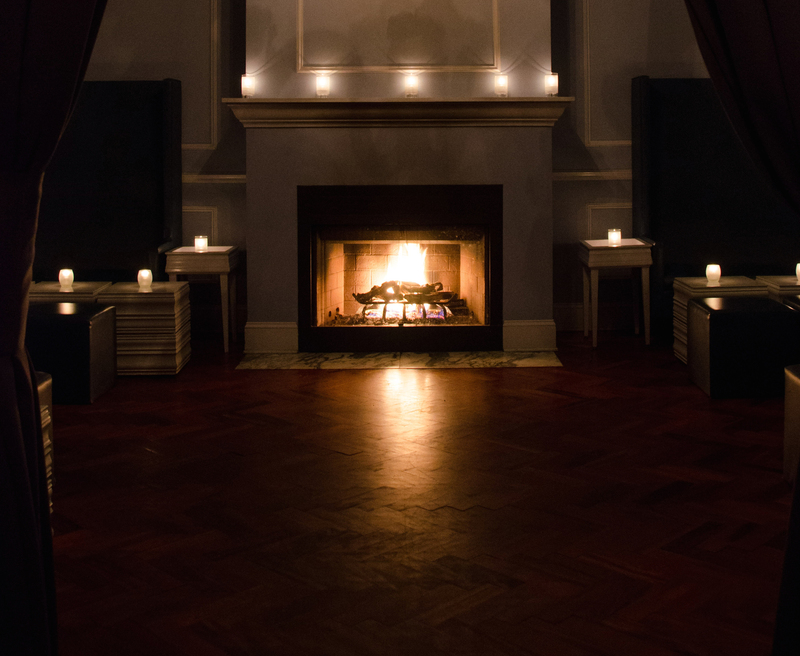 The fire keeps things extra toasty. 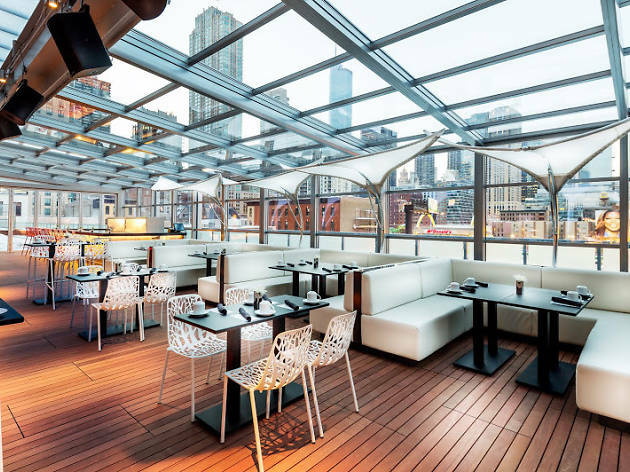 The rooftop of the Godfrey Hotel has an expansive outdoor lounge with fire pits. 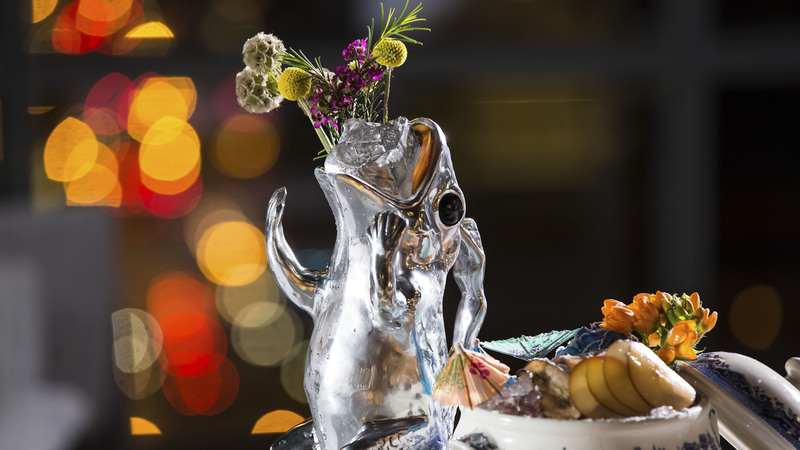 Curl up with one of their hot cocktails and enjoy the view. 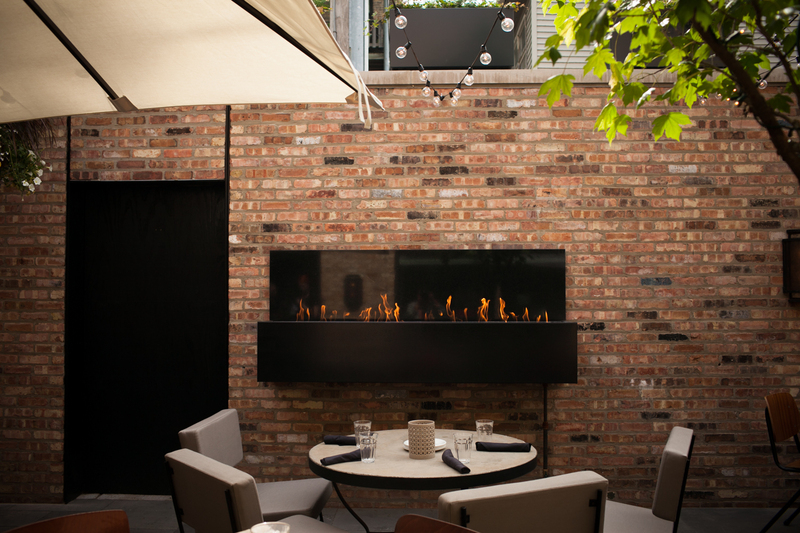 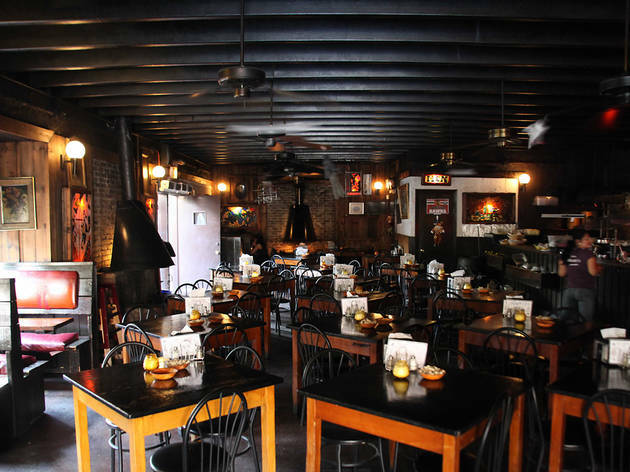 The patio seats 80, and is equipped with a fireplace and heaters, so you can dine out even on the chilliest of nights. 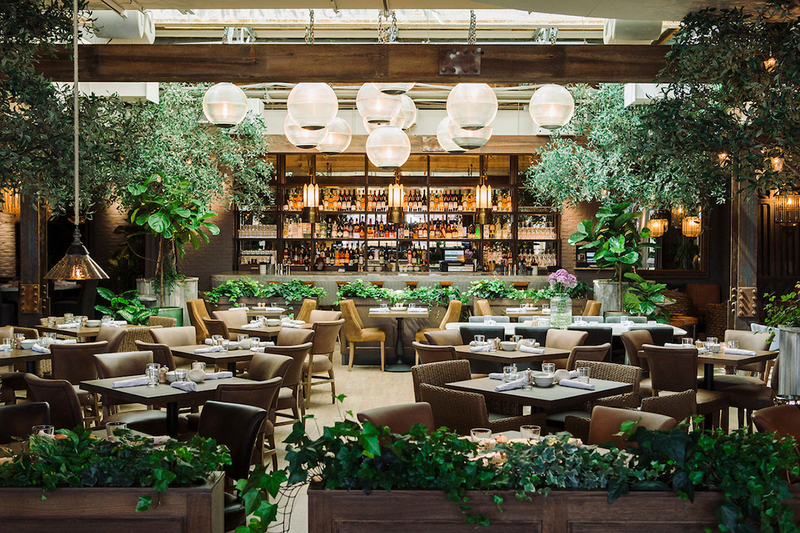 The menu draws ingredients from the organic rooftop garden. 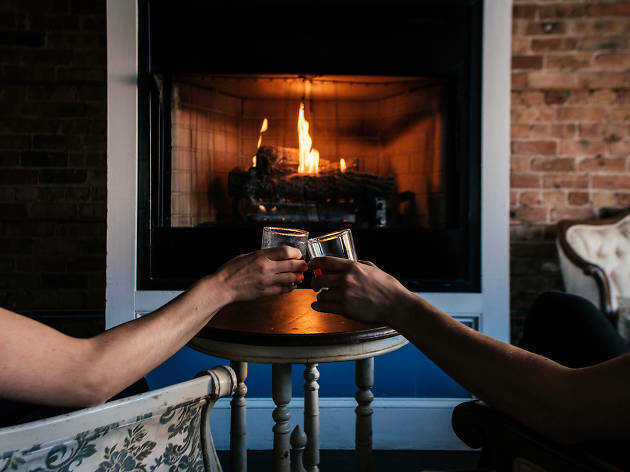 With more than 200 beer selections (and plenty of whiskey) to choose from, the gastropub will make you want to stay all winter—especially by the fire. 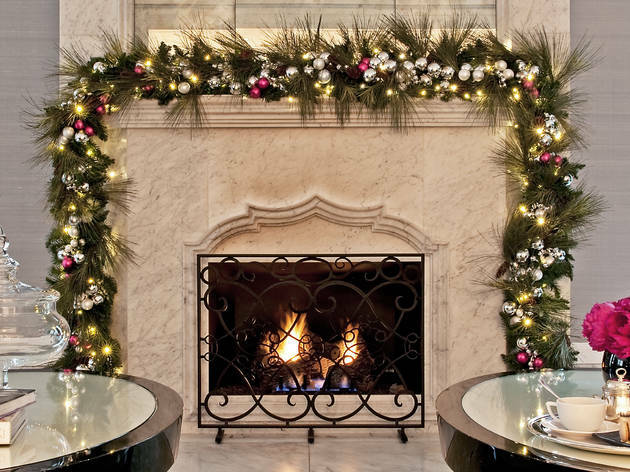 Sit by the fire and order a few small plates and cocktails while you enjoy the Christmas decorations at the Waldorf Astoria. 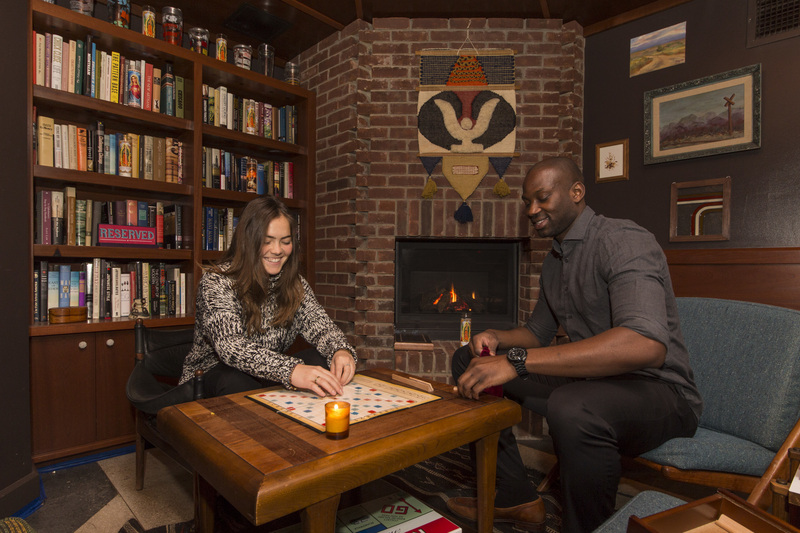 Feeling competitive? 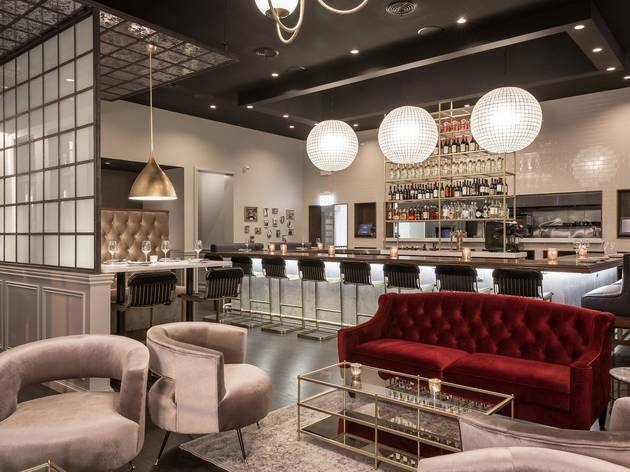 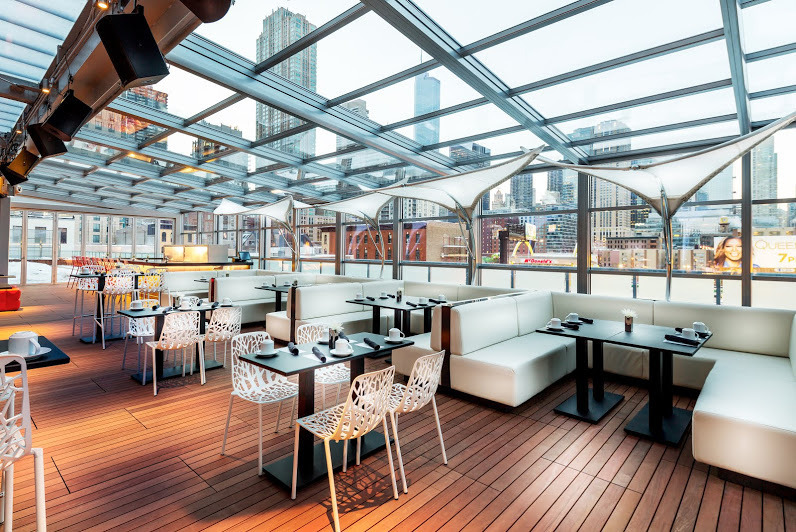 Head to this River North hotel and check out the new outdoor curling rink. 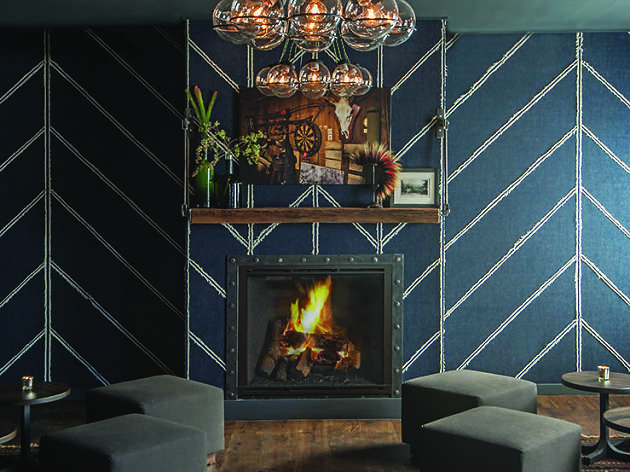 Retreat to the posh fire pits to warm up between matches. 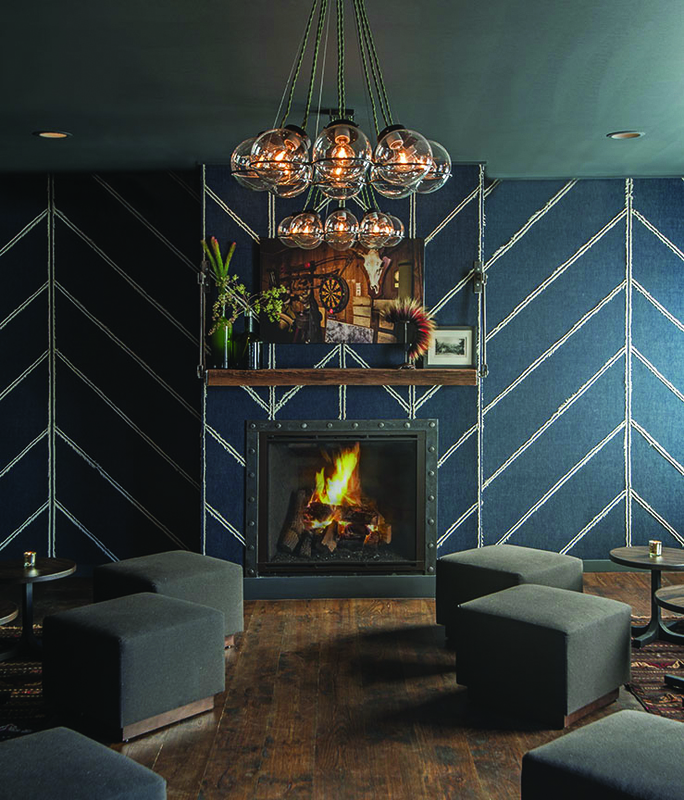 This beer-and-burger haven has two fireplaces, so you'll stay warm while digging into the Moody Bleu burger. 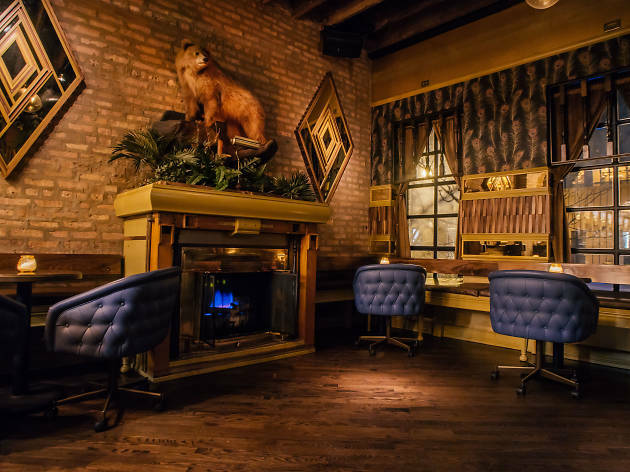 Northside Bar and Grill has not one, not two, but three fireplaces—in their atrium, back room and heated smoking lounge. 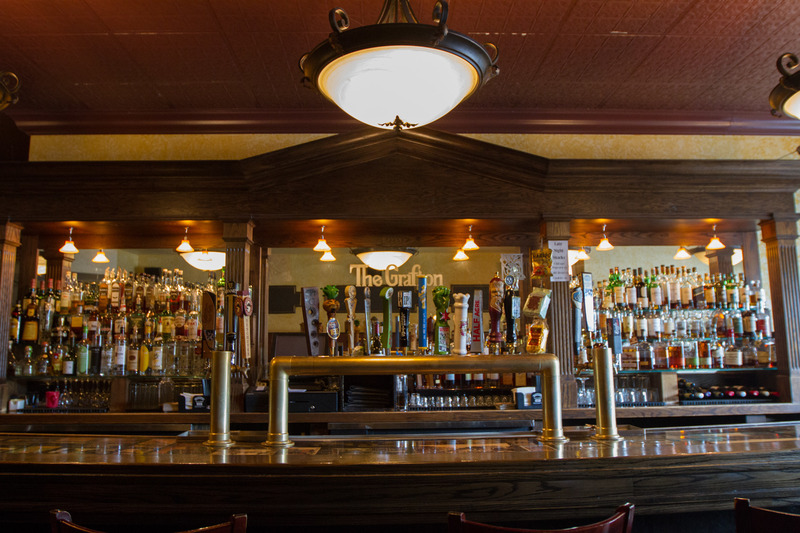 Stop by, grab a drink and play a game of pool while you warm up by the fireplaces. 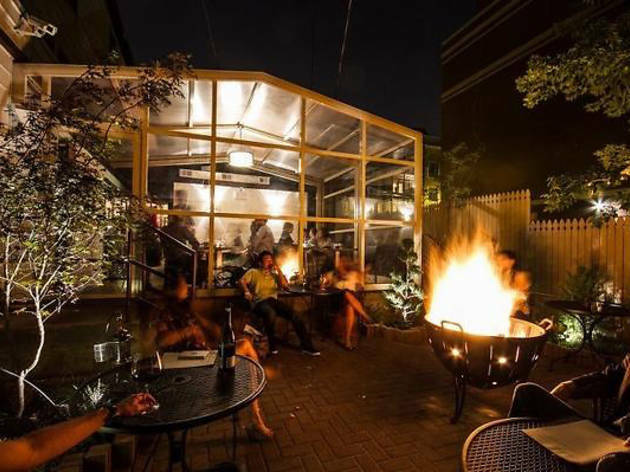 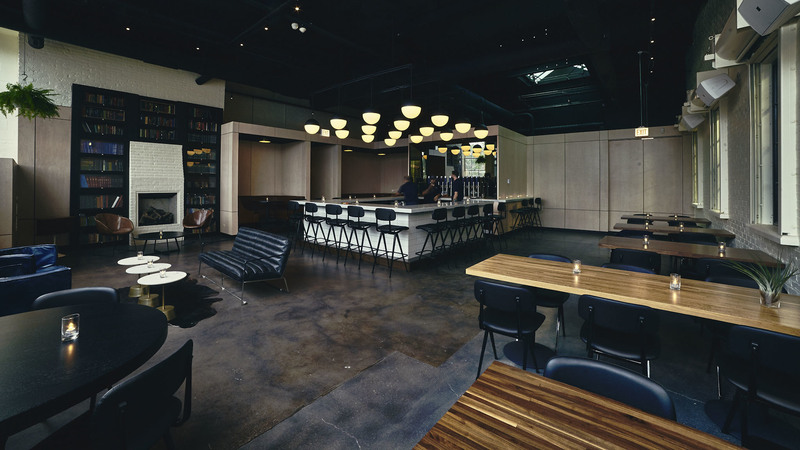 Order a local beer or cocktail and sip it by the fire at this low key Lincoln Park spot. Table, Donkey and Stick feels like a rustic après-ski chalet, and the back patio's fire kettle only adds to the appeal. 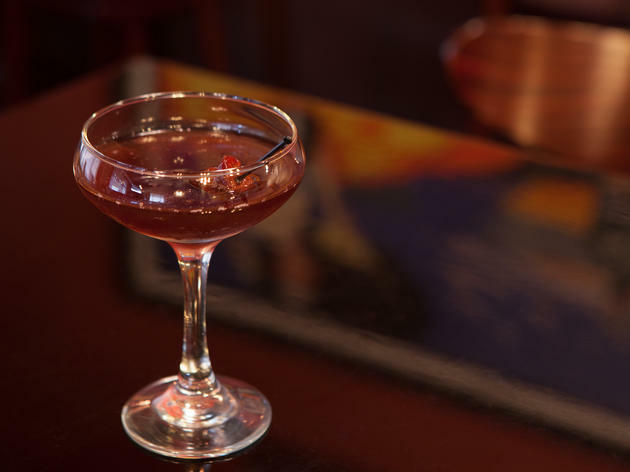 Warm up with chartreuse-laced hot chocolate. 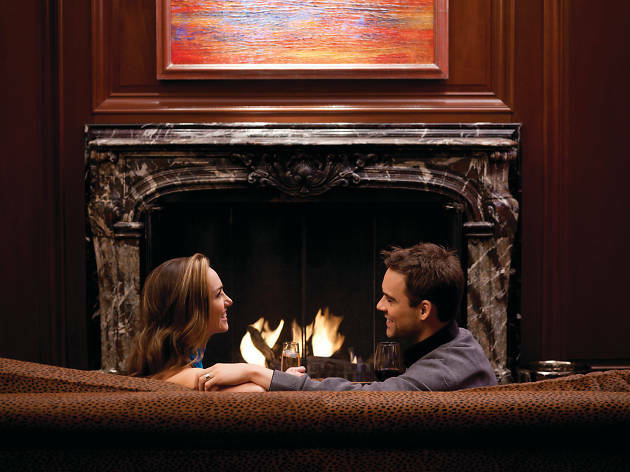 Enjoy a classic American meal by the double-sided fireplace at Remington's. 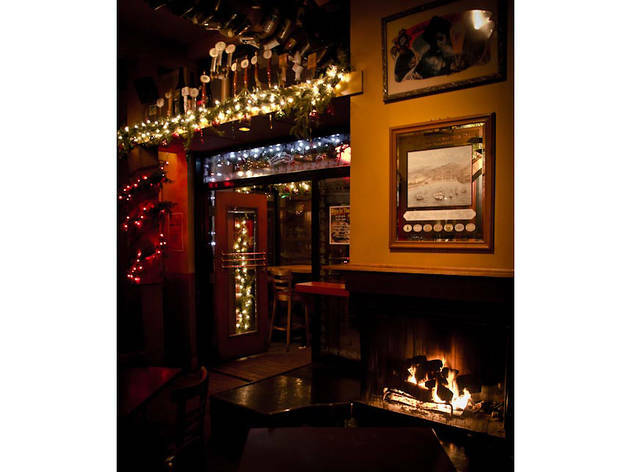 Sheffield's has two fireplaces, including a super cozy one in the beer garden. 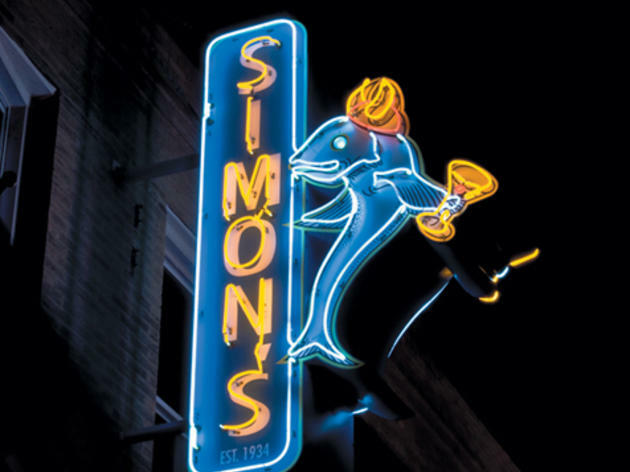 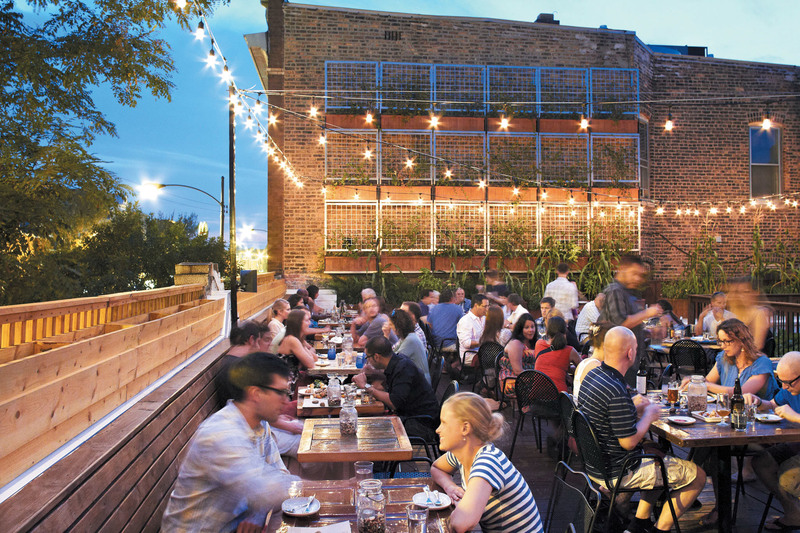 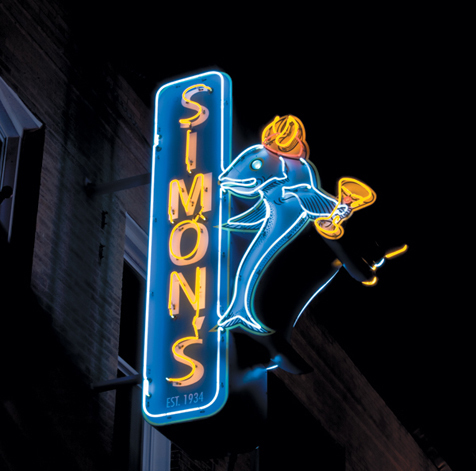 With one of the best beer lists in town, it's hard to not get comfy with a beer and barbecue. 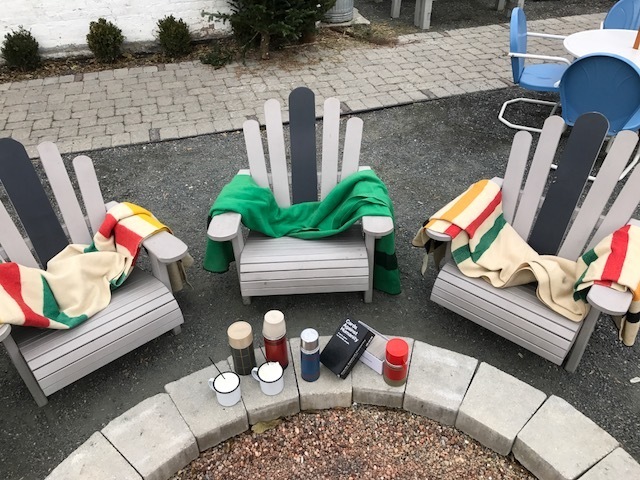 It's Glogg time! 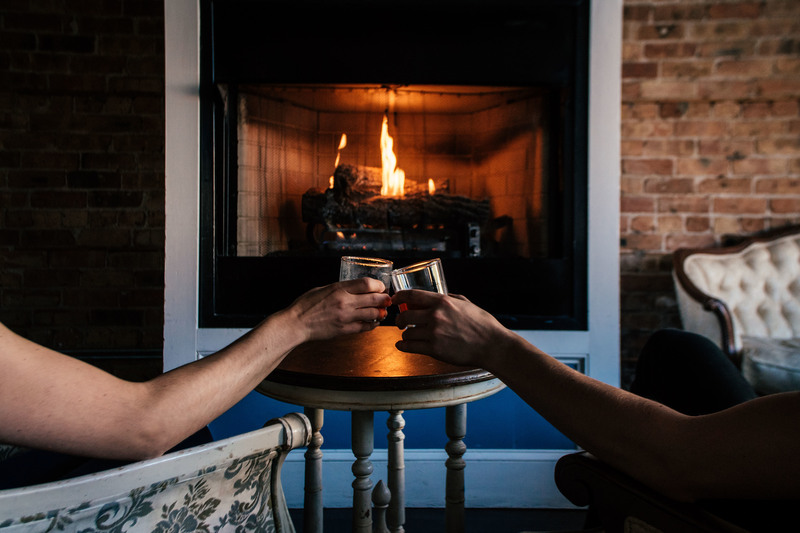 Sip the warm wine on a couch next to the fireplace. 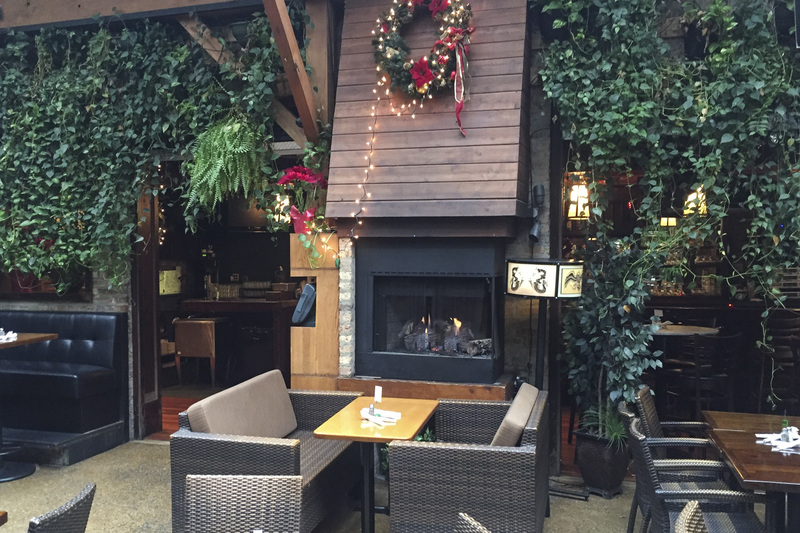 Hang out on Stella Barra's all-season patio, equipped with a wall-mounted fireplace to keep pizza lovers warm all winter long. 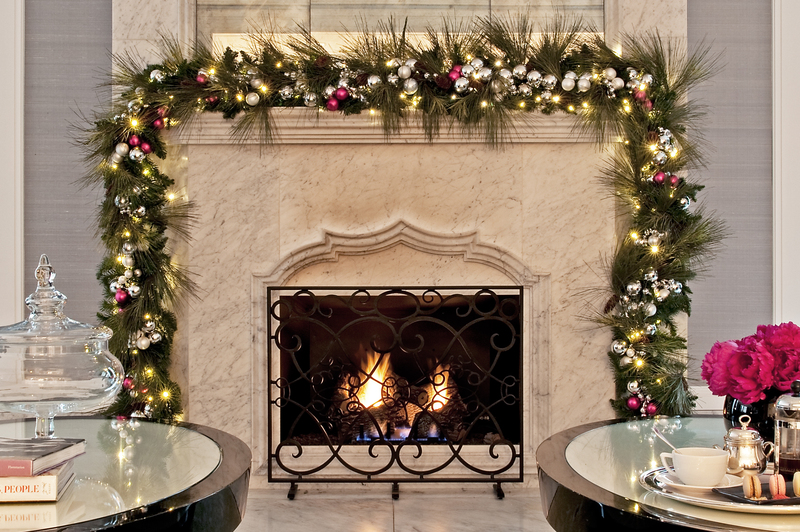 Nestle up by one of the fireplaces and enjoy the Christmas decor in the lobby of the Talbott Hotel, where you can get cocktails from 20 East. 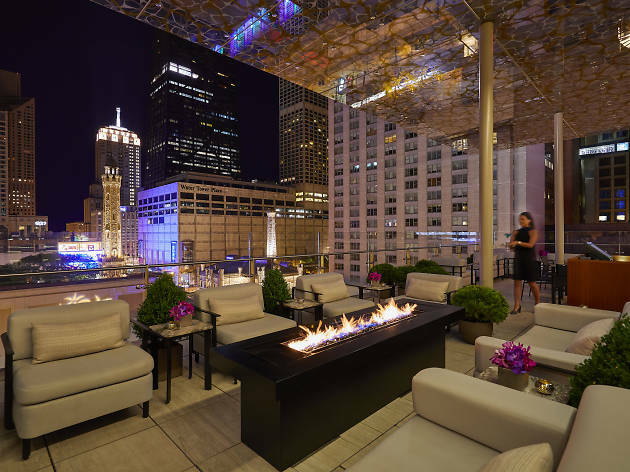 The ROOF on theWit isn't just for summer—come winter, there's a fireplace to snuggle up next to and a retractable roof to keep out the chill. 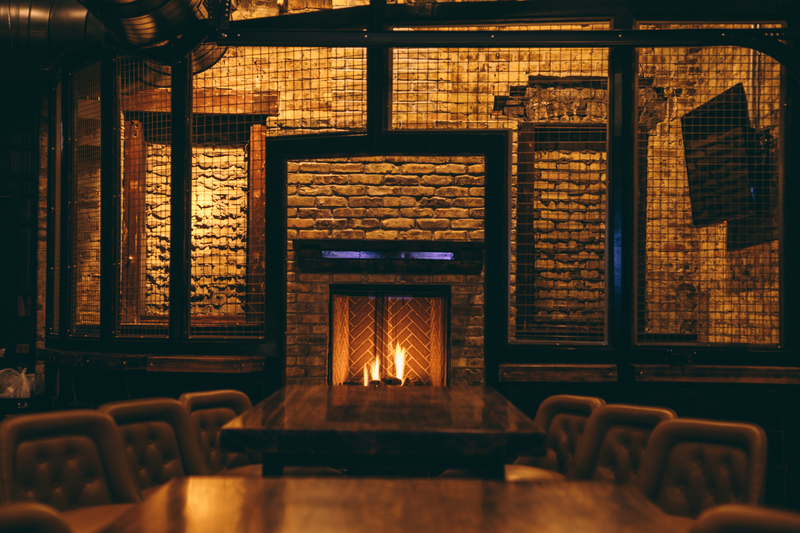 Uncommon Ground has two fireplaces at its Clark Street location and one at the Edgewater outpost (1401 W Devon Ave), so pick your favorite location for unwinding over dinner. 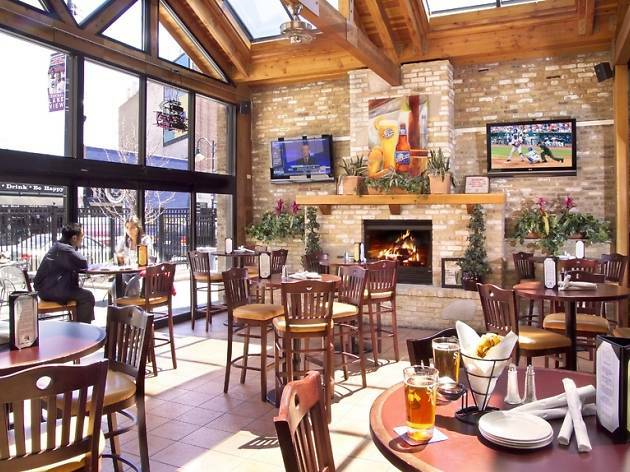 Head to this Wrigleyville bar and restaurant and catch a Blackhawks game while you warm up at one of the tables near the fire. 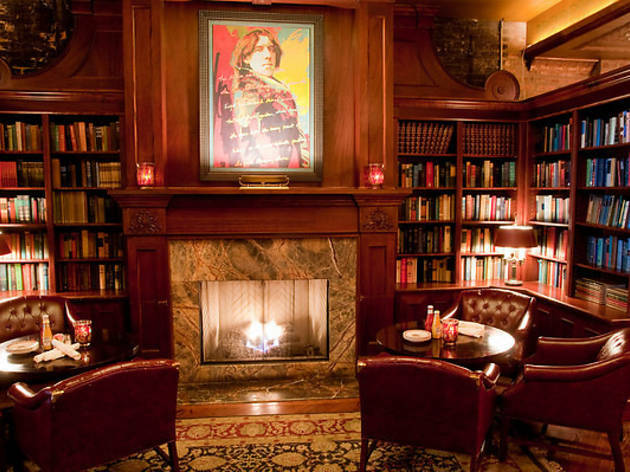 Get comfortable with a book next to the fireplace in the library at Wilde Bar and Restaurant. 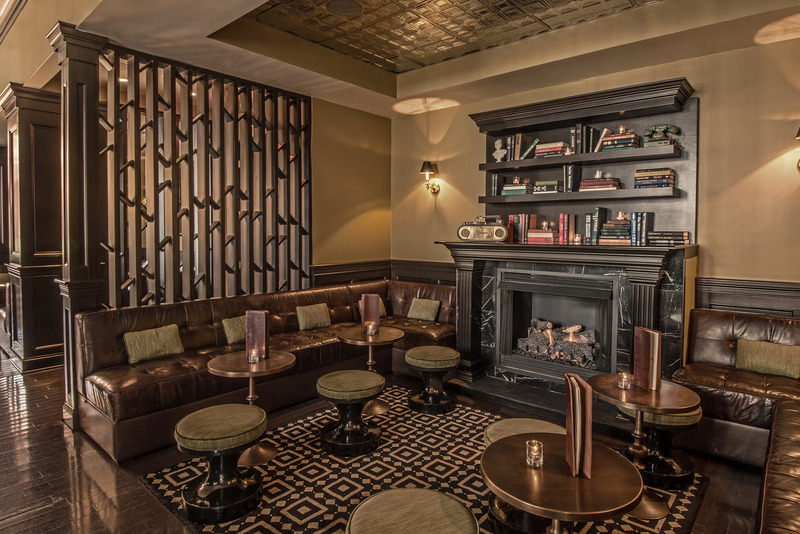 If the fire doesn't warm you up, try a flight from the extensive whiskey list. 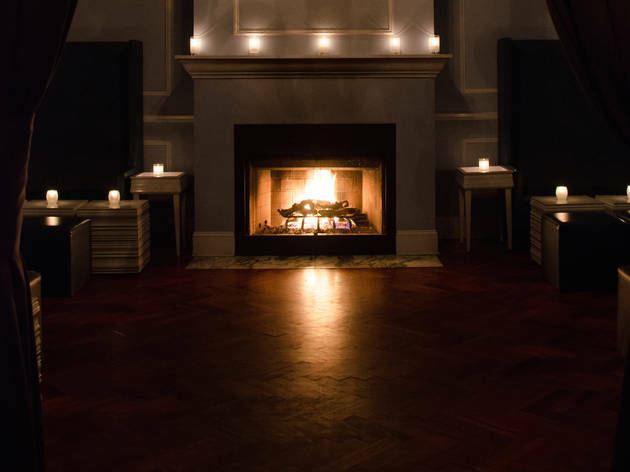 Enjoy rotisserie meats at a table by the warm double-sided fire at the Windsor.